Eggs are a fantastic source of inexpensive, high quality protein. 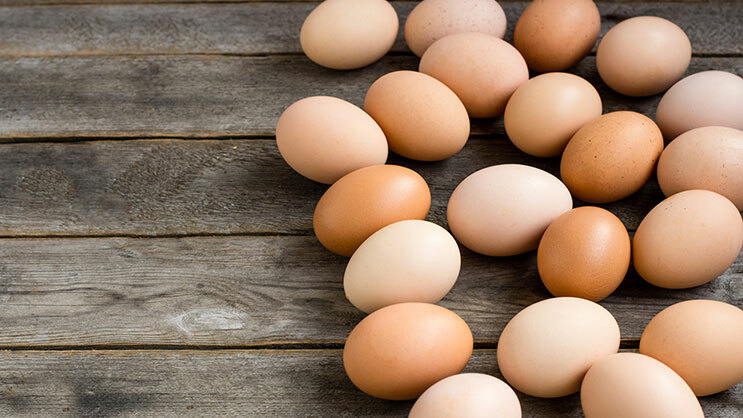 In fact, one egg contains seven grams of protein in addition to 14 essential nutrients including choline and vitamin D. They are easily digested and great for patients experiencing digestive symptoms. The USDA grades eggs as AA, A, or B. AA eggs are the best quality, Bs are the lowest. To be graded, eggs must be clean and unbroken. B eggs are perfectly edible however they contain a smaller yolk and larger air sac. These eggs are best to use in baking. Hens are raised without cages; however this does not necessarily mean the hens are outdoors. Often, cage-free eggs come from birds raised in overcrowded living spaces at large factory farms; so the nutritional content is most likely not superior to standard USDA graded. For eggs to be labeled as organic, they must meet requirements from the U.S. Department of Agriculture: hens must have access to the outdoors (free-range) and be fed organic feed grown without synthetic pesticides, fungicides, or fertilizers. The hens get more exercise, and eat grasses, other plants and insects in addition to their feed, which results in organic eggs having three times more unsaturated fats, 40% more vitamin A, and twice as much vitamin E compared to the USDA standard. Ingredients such as flaxseed, algae and fish oils are added to the hen’s diet, increasing the omega-3 content from about 30mg per egg to roughly 100-600 mg. Omega-3s may reduce inflammation and is sometimes recommended for chronic digestive disorders. Hens are raised outdoors with continuous access to fresh food and water, as well as grasses and insects. No standards currently define the outdoor environment, nonetheless free-range eggs are a better option than the standard USDA egg and may contain superior nutrition. This is a misleading claim, since hormones and antibiotics are not used in egg production. If hens are sick and treated with antibiotics, their eggs should not be sold as human food according to FDA regulations. The breed of the hen determines the color of the eggs. While omega-3 content is slightly higher in brown eggs compared to white eggs, the overall differences are not significant. Brown eggs tend to cost more simply because the hens that lay brown eggs are larger and require more feed. The average American consumes roughly 268 eggs each year. If eggs are a staple in your diet, it’s important to understand exactly what you’re purchasing and putting in your body. For those who can afford them, organic eggs are a great option since have the most proven health benefits. However, regardless of which type eggs you buy and eat, eggs are still a great source of nutrition and a perfect breakfast, lunch, dinner or snack! Heat oven to 350 degrees F. Beat eggs, milk, salt and pepper in medium bowl until well blended. Add cheese, zucchini, bell pepper, basil and onion; mix well. Spoon evenly into 12 greased muffin cups, about ¼ cup each. Bake in oven until just set, 20 to 22 minutes. Cool on wire rack for 5 minutes. Remove from cups; serve warm or room temperature. Keep frittatas in the refrigerator and re-heat in the microwave for a quick breakfast, snack or appetizer.